Last month,Wess Johnson, one half of the duo Wess & Dori Ghezzi passed away. 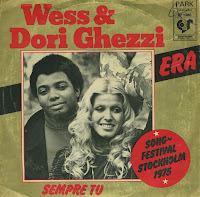 Wess and Dori were a very successful duo in Italy. They represented their country during the 1975 Eurovision Song Contest, which took place in Stockholm after Abba's historic victory the year before. The song they performed was 'Era', an Italian love song. The song finished third in the Contest.